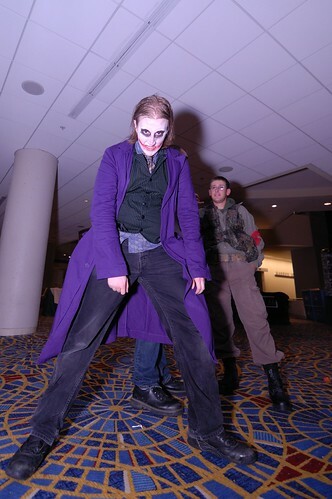 Because there are so many people taking pictures of so many cosplayers at an anime convention, I thought some miscellaneous tips and links to tips might be helpful. Not everybody need bring a dSLR, there's great photography being done with smartphones and everything in between. So some of what I post will useful to some, useless to others. I hope others can share their past experiences taking pictures here to help everybody to get the best results they can. Lighting - it's very important as one might guess. Too little, and you really can't see the subject. Too much and you wash your subject out. Sometimes, you just don't have a flash to give you that extra oompf or you realize that the flash is too bright and you don't have a diffuser. If all you have is an on camera flash and you think it's too bright, tape a single or double layer of napkin or tissue over the flash to soften it. Looks goofy, but it works. You can also make reflectors using index cards and tape. Just make sure those paper items are white, white, white. Translucent plastic work as well. If you have access to natural light - on the balcony or outside on the street, you may find it too bright and your subject may be too dark or get washed out. Either get your subject to a shaded area and reflect light onto them or place either an opaque or translucent barrier between your subject and the light. You can also do both - block light and reflect other light depending on the effects you want. If you are one of those shooters that has one or more strobes that you can remote (using Nikon CLS, Canon's version of that, or pocket wizards), there are probably bystanders willing to be your voice-activated light stands. The best thing to have with you? A friendly, non-threatening demeanor (meaning don't be creepy) and polite manner when asking to take someone's picture. Remember to say "thank you"! If you plan on posting any image, make sure your subject is okay with it and tell them where you will be placing it if they have no objections. I will tell my subjects where they can find it, usually on deviantart or flickr ( i try to have buciness cards with me) and let them know that if they want a full up 300 ppi image, to ask for it, providing me with details related to the time that I shot the image. This website can explain what is what so you can determine how large you can blow an image up to. Can't afford Lightroom, Aperture, or Photoshop? Use picasa or GIMP. There are versions for PC and MAC both. And as indicated, they are free and can do most of what people shooting happy snaps need done. Image too bright or too dark? Say you are using "shutter priority" and you want to shoot at 1/60 or whatever and you don't want a slower shutter speed than that because you know there will be shake or some other annoying interference, by increasing your exposure compensation, you allow more light making a brighter picture - decreasing exposure compensation will give you less light at that shutter speed. This feature can be particularly useful if you are using a flash, whether on a point and shoot, compact digital or dSLR. Fill Flash: If you have a point and shoot and you have a chance for a great shot, and your subject has bright light behind them (which will usually make them dark) - use what is known as fill flash. Force your camera's flash on. Try it at home before you come to the Con so you won't be unprepared for strong backlight. Of course, if the look you are going for is silhouette, forget fill flash and under expose. Got flash units (speedlites or speedlights - there is a difference of branding) - check this tool out. Hand one to your voice-activated light stands at the Con. Those are some pretty handy tips. I just learned how to utilize fill flash myself. I also would suggest looking for a camera that has a good "optical" zoom. Most current models do. Optical zoom provides for much better close-ups than digital zoom. Awesome!~ Glad someone else has provided to this thread. Great tip, too! I have some friends that advocate de-saturating images - baloney! You taking color pictures? Oversaturate!! Especially at an Anime con. Auto-focus assist light - That's the light on the front of your camera that illuminates when you depress the shutter (it's different than the on-camera flash) I turn mine off because it draws your subject's attention and they look at you - remember this at concerts, don't distract the artists. If you camera isn't focusing in low light, switch to manual focus if you dare. You can leave it on if you aren't comfortable without it. We'll understand. If you have the time, don't place your subject in the bullseye, meaning avoid centering your subject and instead use the negative space around them to make it more interesting. Don't position your subject so that it looks like they have something growing out of the top of their head. Try not to take the picture from your standing height. Instead, crouch down or get above your subject - manipulate the perspective. Pictures of people wearing glasses. If you can dismount your flash and remote fire it, position it so that it fires up or down upon your subject, just enough to keep the flash from reflecting in the glasses back to the camera. take the Low shot, this guy was about 5'4"
Some more tips, whether you want them or not!! 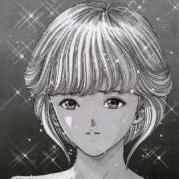 Interests:Well, anime, manga, and video games of course. <br />Other than that, acting, music, sewing, caligraphy, fashion, Dr. Pepper, and of course, Jack Skellington. If you're posing or taking pictures, please don't block the hallways ): Be considerate! If they really want to take your picture, they'll follow you a few steps off the beaten path to take a shot that doesn't mess with traffic patterns. Indeed, great tip! Place that one in the "common courtesy" category, something we can't have enough of. Just found this at the photo argus: 10 Photography cheatsheets!! there are some other cheatsheets listed below that one, some work, some don't. Nikon USA has a free app available on iTunes that is filled with useful bits whether you have a point and shoot, compact digital or dSLR camera. The topics, although certainly Nikon centric, will be useful to anybody regardless of camera brand. Did I mention that it's a free app? Canon does not have anything similar that I have found. Nor Sony, Nor Pentax, Nor Olympus. None that I saw were free, anyway. Panasonic has several free Lumix-related apps for their cameras. Anybody with a iPhone will find this free app useful for iPhone photography. If you haven't seen my cosplay images from the past two years, give em a peek at flickr (search for user/member "gremlich") or go to my deviantart page, specifically in the cosplay folder. The tools I use are Lightroom 3 and the Nik Software Silver Efex Pro v 2 (for B&W). I stopped using Photoshop regularly well over a year ago and only break it out to do the odd odd thing. Of course, the staff probably didn't see your suggestion. Wizard World is a different kind of Con, though. Perhaps, logistically, the Otakon staff can't figure out a way to accomodate it. Maybe the extra space in the Artists Alley. The light there stinks, though. Unless you can change your white balance. Think your point and shoot camera's flash is too bright? Makes your subjects look garish? Want some color tinting, use a colored post-it note. Just remember, these things are thinker than tissue and may not let enough light pass through. If you have a dSLR and don't have adetachable flash unit, there are things you can buy to cover the pop-up besides using paper and tape MacGiver style. Would flash diffusing help with Red Eye? Even with Red Eye reduction turned on in the camera, it still happens on a lot of pictures. How to hold your camera? Point and shoots are easy, you push the button one-handed. However, I have seen people at Otakon with dSLRs manipulating the lens using the left handed overhand method instead of using their left hand underhanded to also support the weight of the lens and camera. Using your left hand "underhand" will facilitate less shaky images. One girl got torqued at me for pointing out that her method was incorrect. She said "this is the way I do it" and she was not gracious about it. Obviously, she lacked experience with dSLR/SLR cameras and had a personal problem. Anymore, I just let people figure it out on their own, expecting that they are unlikely or unwilling to accept well intentioned advice. I have been using SLR cameras since 1978 and think I know a few things about holding a camera. "if you are already putting downward pressure on the camera with your right hand on the shutter button, you should counter that pressure and support the bulk of the weight with your left." If you are using a monopod or tripod, overhand or underhand doesn't make a difference. You should, however, develop better focusing habits regardless. One tip that comes to mind and I run across this allot owith fols who purchase nice DSLR but they don't tae the time to actually read the manual that comes with you camera learn it eep it with you at all times trust me I've been shootig for over 35 Years and I still use my manual for ref on some items. Learn how to set white balance (though not very important if you rely on a flash as the flash is always putting out the same color of light and will drown out the ambient for the subject atleast). When you're going for natural light, use presets or custom white balance, a lot of cameras have really crappy auto white balance and will leave an orange or reddish tint to the image when shooting under incandescent light, and possibly green tint to everything under florescent. Another thing, generally you don't want to get too close to the subject. It's better to stay farther back and shoot zoomed in than to get closer and zoom out. Shooting at wide angles, especially if the camera is not level can lead to unflattering distortion, which might be what you're looking for on a specific picture; but, probably not what you want on every pic. 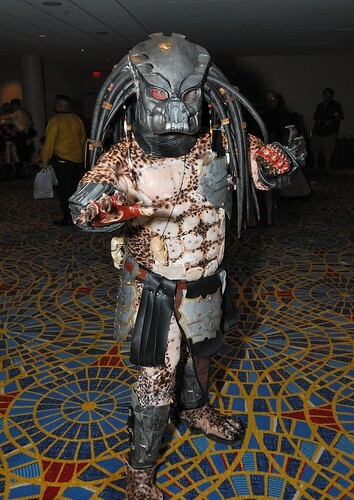 Note how tiny the predator's legs look, this is due to shooting a wide angle, and looking down. This was shot for a very wide angle looking up. @scorpion89 - regardless of your method on three images, professionals do hold their cameras the way I described. That you got three images your way out of how many, does not a better, or "just as good as" technique make. You were fortunate, but maybe that alternate technique worked for those pics (which all seem a little "muddy"). If you have any intention of printing pictures, keep in mind you will probably need to crop the image when printing to a standard photo size. So, if it's a shot you think you want to print, learn what part of the image is going to be cut off when you try to print it, so that you don't lose something important. It seems that a lot of newer point and shoots will allow you to select aspect ratio at the time the image is recorded. Interests:Anime, videogames, cars, photography, videography, and catgirls. I'm a Nikon D7000 and D300s dSLR shooter myself. I also have 2 different Speedlights. I started out shooting dSLR with Canon and quickly switched over to Nikon (I think they have better products overall) and have been shooting ever since. I use many different techniques depending on location, situation, balance, and subject. Megapixels never meant much to me. Even though my Nikon D7000 is 16.2 Megapixel, you don't really need anything above a 6 megapixel camera unless you're printing images on a city billboard. And while convention shooting often is never optimal, you can get some really good shots if you follow some of the pointers in the above posts. ok I have a few questions as a person who will be in a picture. I have requested someone to take a few shots of me at a time that is early in the morning 830AM. and the outfit iIm going to have on is a bold color Red and White. I'm pretty sure this person does not have lighting equipment. Do you (or anyone else for that mater) have an location suggestions that are close to the convention center? since I'm only looking for a few nice shoots I don't want it to be too far away or a place that is not accessible before the con opens. Early in morning will be good for photographs. If they don't have lighting equipment you definitely want to be facing the sun. I'd say the east side of the convention center should be fine, as long as there aren't a lot of people around, you'd have a simple background that shouldn't take any emphasis from you and your costume. What is the opinion of the more advanced photographers with regards to framing the picture with the viewfinder vs. the integrated LCD? Should the focal distances be set to the 100mm equivalent for a 35mm camera(the length used for portraits)? I shoot with a Nikon D200, it doesn't even have Live View (the ability to frame one's shot with the LCD) it is only used for menus, and for image review, so personally, I couldn't frame might shots using the LCD if I wanted to. Reasons I could see for using Liveview framing instead of the viewfinder, well, one would be tripod shooting. I find that it's uncommon knowledge (due to the fact that most people don't read the manual with their camera) that with most if not all DSLRs you need to have something blocking the viewfinder, due to where the light meter is, light entering from the viewfinder can throw off the exposure, which is why the camera comes with a little shield that you can slide over the viewfinder to keep light out of it. With live view you can keep the eyepiece covered and still frame your shot and make adjustments. Another good use would be for macro, thus you wouldn't need to get down on your belly to frame the shot if you don't want to. And, you can raise the camera up to a level beyond your eye level and still see the lcd. @clutch -- The only time I use the LCD is to use the video mode, which I never do. If you have a dSLR and you are using the LCD to compose your image, get a point and shoot camera. If your viewfinder is a proper one (like one found on a Nikon P7000 or Canon G-11/G-12, I recommend always composing using the viewfinder. What kind of camera are you using? That would help us help you better. Using the LCD would be okay, I guess, for simple happy snaps, but if you want more control over more serious efforts, use the viewfinder. For now, I have a point-and-shoot Canon SD1000. It comes with a viewfinder, but wearing glasses makes it harder to look through, and the viewfinder frame doesn't exactly match the picture frame. I have to run some test shots to figure out where the skew is. The Canon G12, and Nikon P7000, are both nice cameras. It is hard to decide which one I like better. The head-to-head reviews seem to favor the Canon, but not by much. The High Dynamic Range mode on the Canon looks pretty cool, but the Nikon lens goes to 200mm equivalent. This Otakon will probably be with the SD1000 again, due to funding. Well, for the most accurate framing, on a point and shoot, the LCD will be better as you're looking at essentially the final image, whereas the viewfinder is going to be offset to some degree. I never had much trouble accounting for the offset on my dad's camera when I would play with it; but, a lot of people have trouble, even with just snapshots, you know all the countless stories about people cutting people's heads off on pictures. That said, the viewfinder will give you a more stable shooting position than holding the camera out in front of you. Holding the camera tight against your head, with your arms tucked into your body will be more stable than holding your arms out in space, whether that's enough for a noticeable amount of blurring is going to vary based on the photographer, and the lighting conditions. I wear glasses so you'll get no sympathy from me about using a viewfinder whilst wearing them. To me, that's just an excuse to not use the viewfinder. I'll never pooh-pooh a Canon because I own only Nikons - Canon is good product. Of course, Gimme a Hasselblad with a 56 MP digital back and I'll put down anybody else's non-Hasselblad camera. The P7000, with the current firmware upgrade gives the G-11/G-12 a run for their money. Both cost about the same and there are tradeoffs still. Here is a comparison with reviews of the two. The camera you have should do well for you provided you are in the presence of good light. P&S are limited, but great for happy snaps (like smart phone cameras and people are doing amazing things with those). Since I've mentioned the "golden hour", I should also broach "the blue hour"
That link above will take you to one site focused (no photography pun intended) on blue hour photography. Since many of the con goers will probably be up during either or both blue/golden hour periods, maximize your shooting opportunities and take pictures others have not been. Remember, mid-day sun About 11 am to 4 pm in the summer stinks for lighting unless you take precautions like shade (man-made or natural) and lighting (man-made (flash or reflectors) or natural). What this means is that the primo blue hour light for images is about 0500 (maybe even 0430) to 0545 in the morning and 2040 to 2120 in the evening for all three(four) days. Fewer people are around in the morning, even the bums have to sleep. Something to think about, when the sun sets (meaning when it touches the horizon) it is already about 15 degrees below the horizon, its "image" is being reflected off the atmosphere. That's why it gets dark so quickly in the evening. slow synch flash can create great effects in a rave or dance environment of dim lighting, and glow sticks and lights. One of the things about shooting with flash, it always gives you too much light sometimes. That's why I have an SB-700 and 2 SB-600s - to control the amount. Something I'm still working on - light balance. I usually use prime lenses (fixed focal length). In the case of general hallway photos, a 35mm lens is decent on APS-C sized sensor cameras. Due to the crop factor it makes it close to the standard normal focal length of 50mm on 35mm full-frame cameras. In my case I can easily use a 31mm f1.8 for 90% of the convention. Sometimes I use two camera bodies. For example, the main camera would have a 14mm f2.8 with a neck strap. The second would have a 55mm f1.4 with a hand strap. I take some portrait style photos with the longer focal length combo and put that in a shoulder bag, then the other camera I use for general full-body photos. Diffusers like the white push-on plastic Stofen ones usually require some exposure compensation. With my equipment I take it down 1.3 - 2 stops indoors. Outside depending on he conditions I can leave at default. Using high speed sync or second curtain sync are two options to help level out foreground and background exposure, but they also provide other benefits. Generally high speed sync would be used in bright sunlight so you can remove harsh shadows and it also allows you to use larger apertures to decrease depth of field (eg. smooth background blur), thanks to the higher shutter speeds available. The negative is that your flash won't be able to fill a scene like it could using x-sync or slower because it needs to put out continuous short pulses of light. Second curtain sync is good in dark situations where you want to make the background brighter to match your foreground subject. So if you used a 5 second exposure, the flash would fire at the end of that to light up your foreground subject. Depending on how you handle it it is a good technique for action photos (as someone demonstrated above with nice photos). I can add something for taking a good picture with a smartphone. If your smart phone is equipped with a flash and are taking a picture in anything not low light, turn it off. General rule of thumb, if there is enough light to read by, the flash should be off. If you don't believe me take a few pictures around the house and compare. I learned this from a Samsung representative when I was working tech support for a cell company. If you can't find the setting, check the manual, if you've tossed the manual Google your phone's model. found some new smart phone apps people may be interested in, but, they cost a little bit. one other item - make sure that all of your camera batteries are charged (I have two for my dSLR). Bring your charger as well. Buy a multipack of AA or AAA if that's what your camera uses (or rechargeables of those with a charger). T2i user here, gonna be my first Otakon with this nice little toy. This thread has definitely been helpful, thank you!